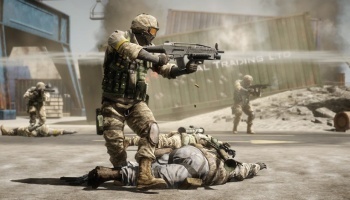 Electronic Arts says it's ready to launch an "attack" against the hugely popular Modern Warfare series and it's looking to the upcoming Battlefield: Bad Company 2 to make it a success. There's no question that when it comes to modern combat shooters, Activision's Modern Warfare franchise rules the roost. The games have made truckloads of money for the publisher and turned Infinity Ward into one of the most highly-regarded developers in the business. EA says it's gearing up to challenge that state of affairs, but not, surprisingly enough, with the recently announced Medal of Honor overhaul. "In March we will launch Battlefield: Bad Company 2, which is our first strong attack on Call of Duty," EA Europe Senior Vice President Jens Uwe Intat said in an interview with MCV. "The shooter space is one we don't want to give up. It's an important genre and we were the number one," he continued. "So we are certainly working on how we can get that crown back and Battlefield: Bad Company 2 is an important product in that context. The franchise is strong, with a good product record." When I first saw the headline I assumed that the revamped Medal of Honor would be EA's weapon of choice and not the online shooter from DICE, which is respected but hardly a genre killer. After watching some of the videos at the Bad Company 2 website, however, particularly the Panama Canal gameplay trailer, I can't help but think that maybe Intat is onto something. "If any of our studios can take on Modern Warfare then it's DICE," he added. Battlefield: Bad Company 2 is scheduled for release on March 2 for the Xbox 360, PlayStation 3 and PC.